This was originally planned to be a 2017 Honda Ridgeline review, until Honda Canada called me at the last minute to inform me its Ridgeline had been demolished by another journalist. Of course you do Honda. Because these days, you’re on a roll with three versions of a new Civic, a freshly redesigned Pilot SUV, a facelifted MDX, a brand new NSX supercar, and a Ridgeline pick-up redesigned from the ground up. It makes sense that all your press cars are overbooked. Mind you, the fact that the TLX isn’t being reserved by journalists may feel a bit sad, but it doesn’t mean it’s an uninteresting car. The reality is, except for a new red paint color and an optional body kit, there’s just nothing new about the TLX for 2016. It’s also a car that flies a bit too much under the radar to get noticed. And that’s precisely why I felt it was a good idea to take the Acura TLX SH-AWD out for a second drive. After driving pretty much everything on wheels for the last 6 months, I felt this was a good opportunity to dig deeper into Acura’s stealthy sports sedan in hopes to finally pinpoint where it stands in this plethora of sporty luxury cars. As you all know, I’ve already done a thorough review of this car – this exact same one as a matter of fact. This is why I won’t go into much detail about the TLX’ looks, pricing, and creature comforts; you can find it all in that last review. Instead, I’ll focus on the TLX’ driving dynamics. You see, ever since Acura launched the TLX back in 2015, they’ve been shoving down our throats the notion that this is an exhilarating car. One that gets our pulse running. That it’s “that kind of thrill”. Unfortunately, the last time I drove the TLX, I can’t say I was particularly impressed with its sporting pretensions. 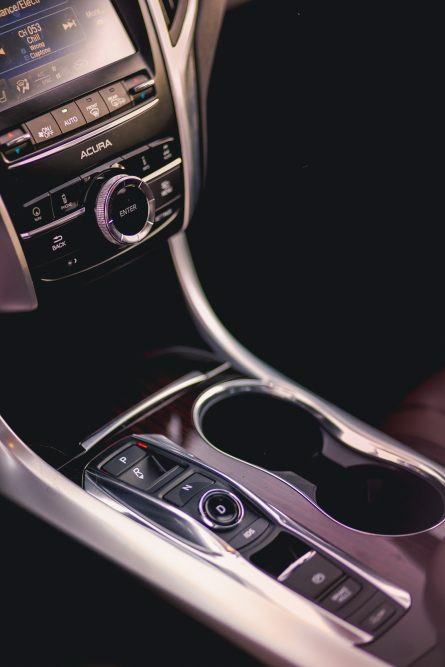 Feeling more like a Honda Accord with superpowers, the TLX failed at distinguishing itself as a true contender in the mid-size luxury sports sedan segment. It simply didn’t feel special enough compared to its European and American opposition. 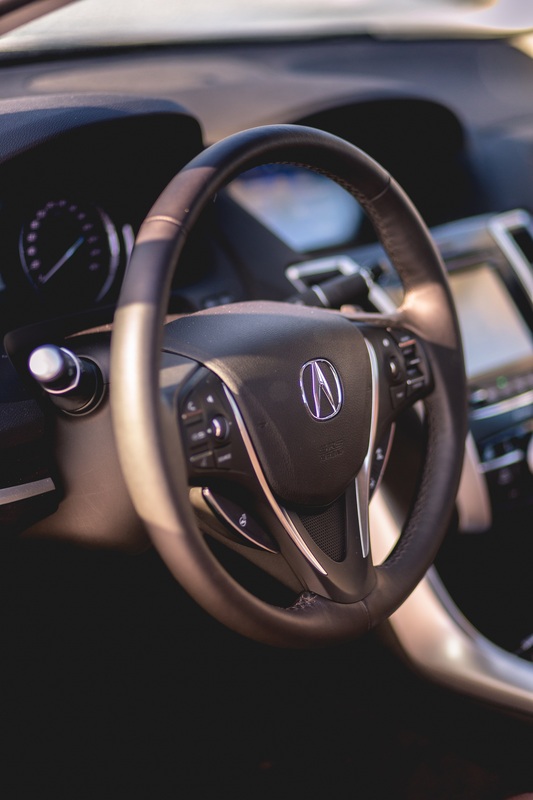 Because Acura would like you to believe that its mid-size sedan will get you just as much performance, luxury, and refinement as the German competition while being thousands of dollars cheaper. And in some respects, the TLX accomplishes these tasks rather well. But from where I was sitting, the car lacked the performance edge we used to find even in older Acuras. In that first review, I had qualified the ZF-sourced 9-speed automatic transmission as laggy, constantly hunting for the right gear upon downshifts instead of actually downshifting. To make things even worse, the entire system was operated by a furiously unintuitive push-button gear selector that made zero sense. Finally, there was the fact that even when set up in its most aggressive setting, Sport + mode, the TLX’ electronic nannies kept interfering, preventing me from having any sort of good old fashion fun behind the wheel. That being said, I do remember asking myself what the TLX could accomplish if it were set free. I remember thinking “all this technology”, “all these efforts at the racetrack”, “all these acronyms”; they must add up to something. Truth be told, in the everyday world, you can’t fully appreciate the TLX’ technology. It needs to be driven somewhere it can stretch its legs to be fully understood. Luckily, things have evolved at Clavey’s Corner. I now have a trusted relationship with the owners of Sanair. 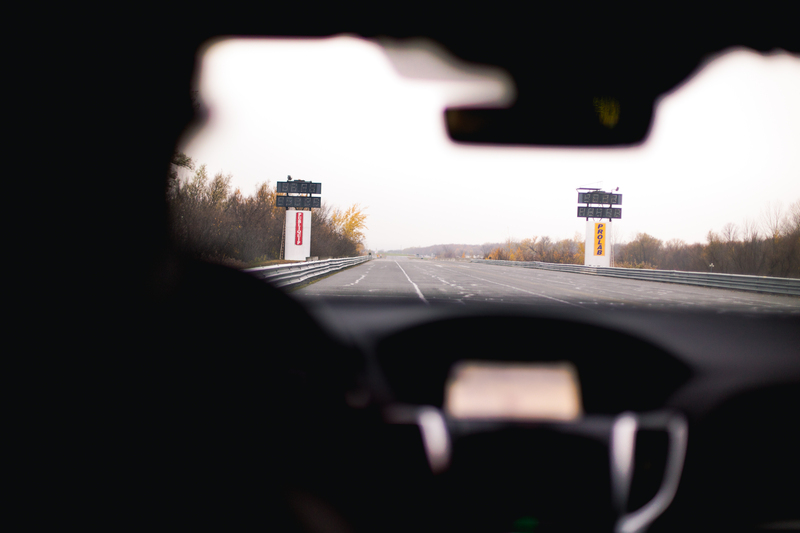 This not only means that I have complete VIP access to the entire facility, but that I also benefit from the expertise of a fully certified driving instructor to help me safely test my cars. 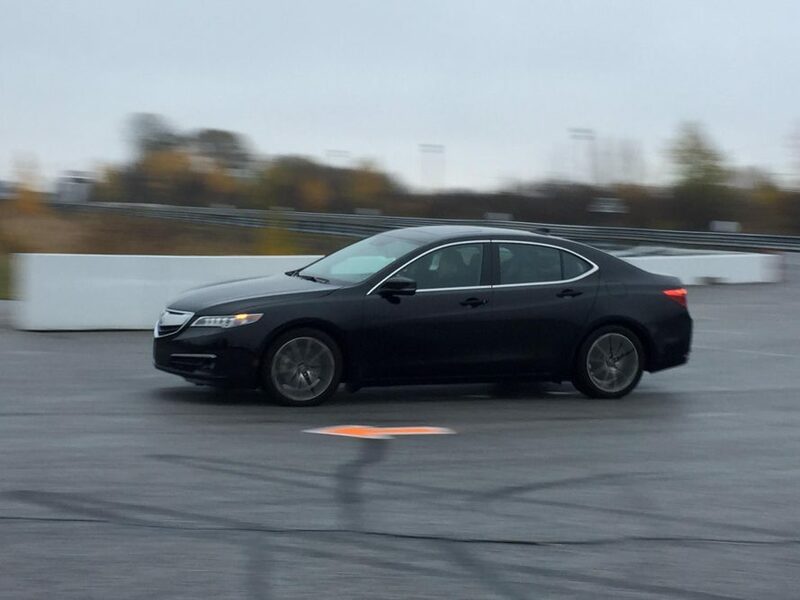 Now, it’s important to mention that I did not race the TLX on the track – simply because it isn’t permitted to do so as per Honda Canada’s press fleet regulations. Also, I’m not a racing driver and the TLX isn’t a race car. What Sanair allows me to do is properly test out a car’s handling limits, braking capabilities, and acceleration times without fear of getting arrested or getting seriously injured. It’s the smart way to test a car. So, the TLX SH-AWD was let loose in the open. The interesting thing was that the day we arrived on location, we were served a daily dose of cold November rain. This not only meant that the tarmac was as slippery as a buttered up cooking pan, but that these were ideal conditions to put Acura’s Super Handling All-Wheel Drive to the test. 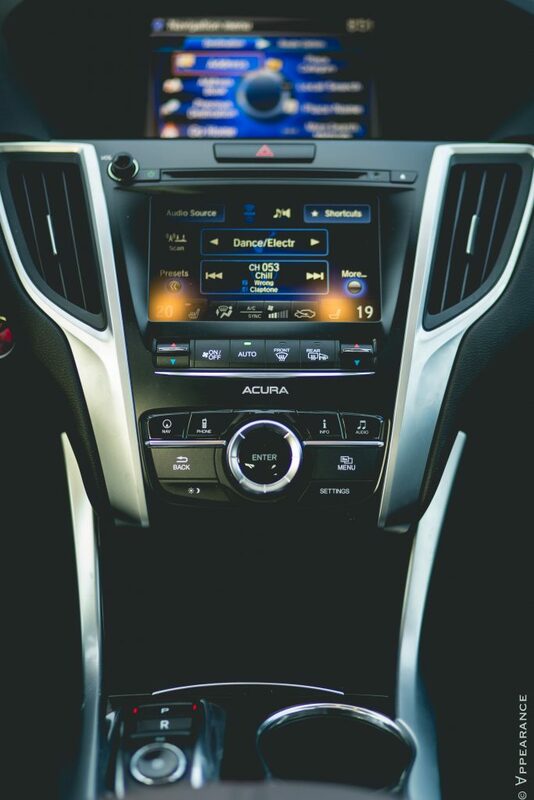 Acura’s system is a rather clever one. 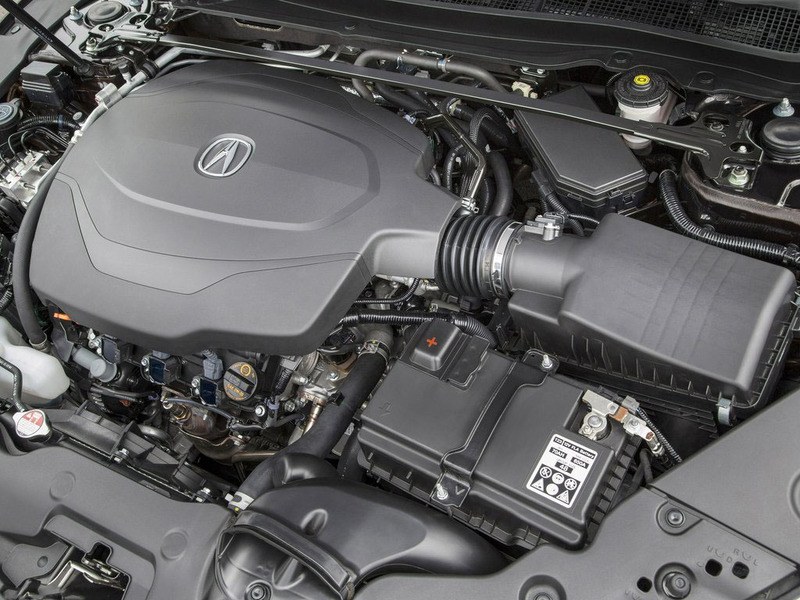 Available only in V6 versions of the TLX, it’s essentially a front-wheel drive-biased torque vectoring system that sends power to the rear wheels when required. The interesting part here is that, unlike conventional all-wheel drive systems, SH-AWD can send additional torque to the outside wheels to improve overall vehicle rotation during cornering. What’s more, Acura claims that this new generation of SH-AWD is 25% lighter and can send more power to a single wheel than ever before. Also new is the ability to detect steering movements and react accordingly within milliseconds, further improving steering response during spirited driving. Finally, SH-AWD can transfer torque to the inner inside wheels to provide a counter-yaw moment during hard cornering, further enhancing vehicle stability at high speeds. It may all sound geeky and technical, but you actually feel the system doing its magic underneath you as you’re pushing the TLX close to its limits of adhesion. And super handle it did. 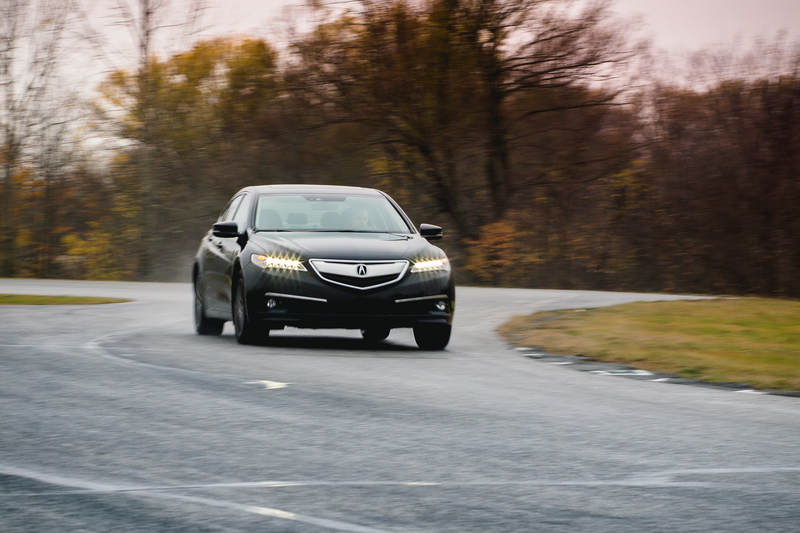 Even fitted with all-season rubber, the TLX never failed to impress. During hard accelerations, SH-AWD allowed the TLX to claw to the ground and leap forward with little hesitation. 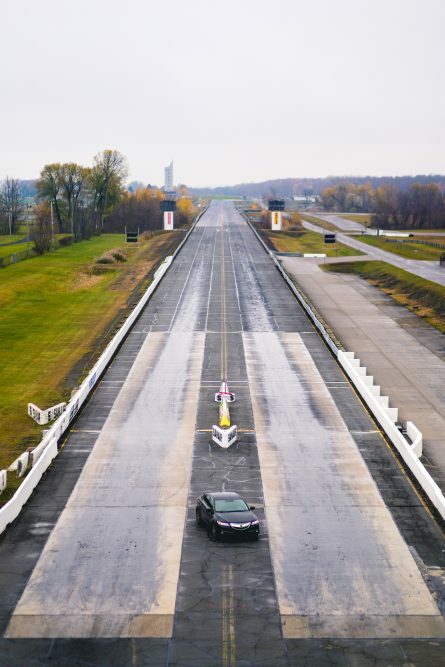 Acura claims a 0-100 km/h time of 5.9 seconds – we recorded 6.5 seconds on this rather slimy surface. Much of that performance credit goes to the immensely competent 3.5L, 290 hp V6, which remains one of the best 6-cylinders in the industry. With 267 lb-ft of torque, and more than ample low end twist on tap, this V6 not only loves to rev, but also comes with its share of satisfying acoustics. Quiet and refined during cruising speeds, it fills the cabin with a throaty induction growl the moment you floor the throttle and has a playful tendency to bark as it hits VTEC past 5000 rpm. Fun fact: Acura is the only luxury carmaker to only offer naturally aspirated engines throughout its entire lineup (except the NSX). And while Honda’s luxury division will soon inevitability head down turbo lane, it’s important to underline how much character a high-revving engine adds to a car. This V6, like the K24 powering the ILX, will definitely be missed and serves as a last hurrah for Honda’s much acclaimed VTEC legacy. But it’s really during hard cornering that the TLX truly shined. 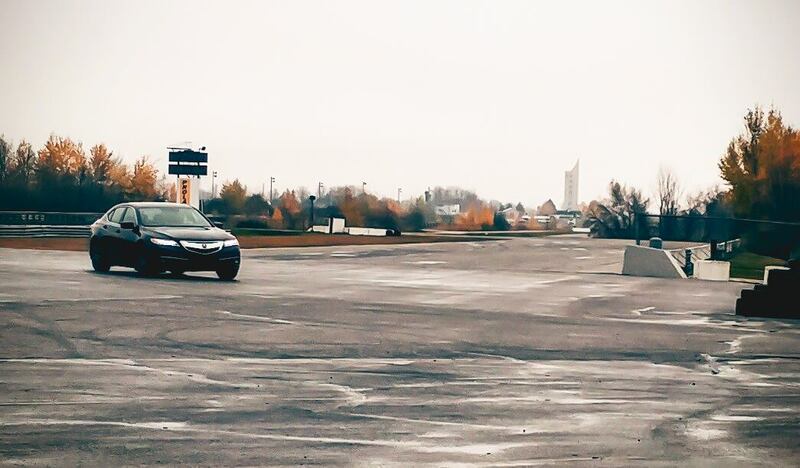 Its limits are high, but Acura has set it up so the driver can explore them in total confidence. Enter a bend fast, and yes, the car will plow forward due to that heavy V6 sitting over the front axle. Give it some throttle input though, and you’ll feel the entire car rotate onto itself, instantly pointing back in the right direction. It may feel counter-intuitive at first, but the system works. As for the 9-speed automatic, in everyday D and Eco settings, it remains utterly useless; not knowing what it wants, furiously hunting for cogs, and causing questionable delays from the moment you hit the accelerator. Our time at Sanair was spent in Sport and Sport + modes. Thankfully, under these settings, the transmission makes more sense. Selecting Sport + sharpens up throttle response, adds resistance to the electric power steering system, and dramatically changes the transmission’s shifting patterns. Also, you’re really only using the first 5 gears in this setting, so the system tends to worry less about finding the right ratio for maximum fuel efficiency, but rather keeping you in the best possible rev range to exploit the glorious V6’s powerband. 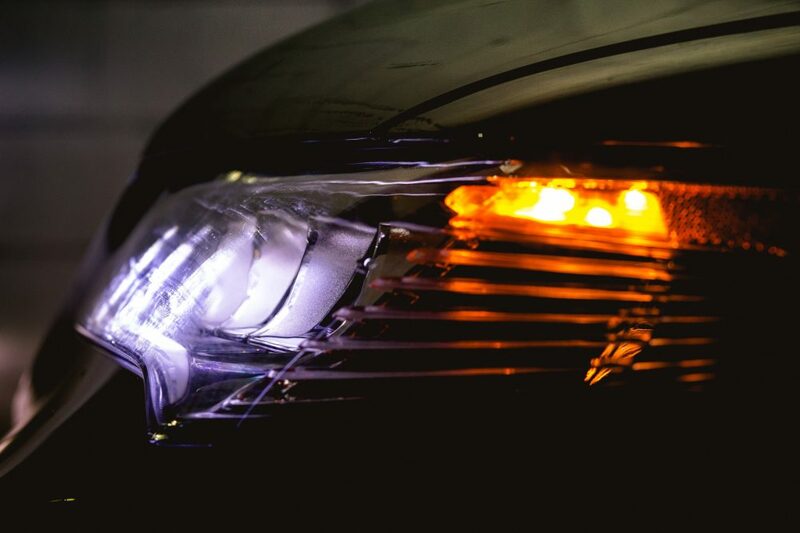 And that’s where the TLX suddenly starts to shine. As I entered corners faster, held on to revs longer, and appreciated the transmission’s nearly seamless gear shifts that I’d manually command through the steering-wheel mounted paddle shifters, I finally found the car I had been asking for – a properly quick and responsive Honda-powered luxury sports sedan. Unfortunately, I had to be on a racetrack at full throttle to fully appreciate it. 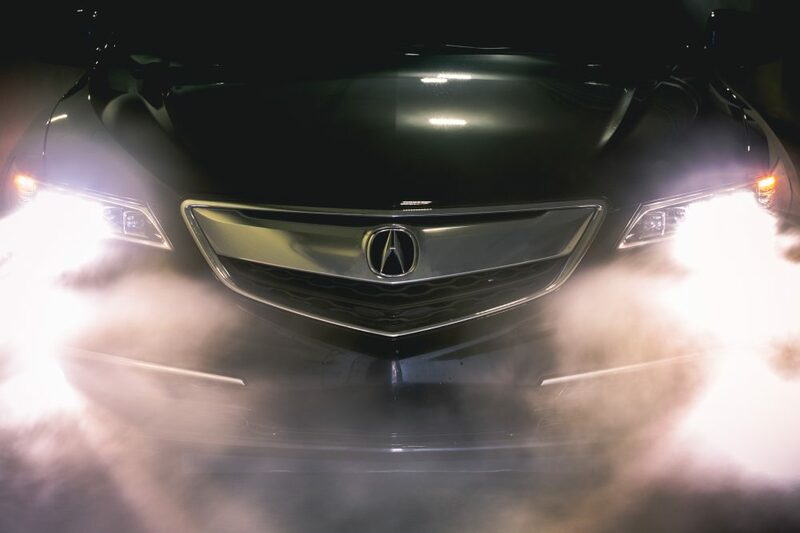 At the end of the day, you can’t deny the Acura TLX’s handling prowess in all weather conditions. The problem here is that Acura isn’t trying hard enough to sell us this technology. It’s hiding within the car, and doesn’t really shine through during everyday driving. And that’s too bad, because there’s serious engineering know-how pumped into this car. Granted, it’ll probably save your life in an emergency situation, but would that really be attributable to the fact that the system had transferred more torque to that inner rear wheel? That said, my gripes with the TLX haven’t changed: the exterior styling, while attractive, still remains too sedate. Throw a quick glance at the car from the rear, and it can easily be mistaken for a Honda Accord – or a Kia mid-size sedan. Also, Acura’s two-screen infotainment system remains more frustrating than practical. Luckily, unlike Honda, Acura understands the value of an actual volume knob, but the system’s interface, while delivering an array of cool tech features, remains unintuitive, confusing, and distracting. Finally, that ZF-sourced 9-speed transmission. If I need to put it in its most aggressive setting all the time to appreciate its full potential, there’s definitely something not right. I mean, we’re talking about Acura here, the makers of the NSX supercar and Integra Type R. We know they can manufacture excellent transmissions. Why on earth did they call out a third-party supplier for this? Didn’t their engineers spent the last 5-years developing a 9-speed dual-clutch system for the NSX? Can’t any of it trickle down to their most important sports sedan? Here’s my final verdict: the Acura TLX is a fine sedan; a technology-packed machine that looks good enough, sounds fantastic, is properly quick off the line, seats 5 comfortably, offers a lot of car for the price, and will out handle a VW GTI on any road surface. But Acura needs to sharpen it up a bit. Make it matter. Let it stand out from the crowd instead of hiding in a dark corner waiting for people to take notice. I know: how about slapping a Type-S badge onto its trunk? + Comfortable and quiet interior. + SH-AWD: impressive in all weather conditions. – Laggy push button 9-speed transmission. – Unintuitive and complicated infotainment system. – Doesn’t feel special enough. Hi, so in final verdict, do you think due to the 9spd ZF trans. can one still own it in long term and get used to laggy ness if they are coming from a CVT Accord? You will get used to it, it’s definitely more engaging than a CVT and will allow you to extract more performance from the drivetrain.